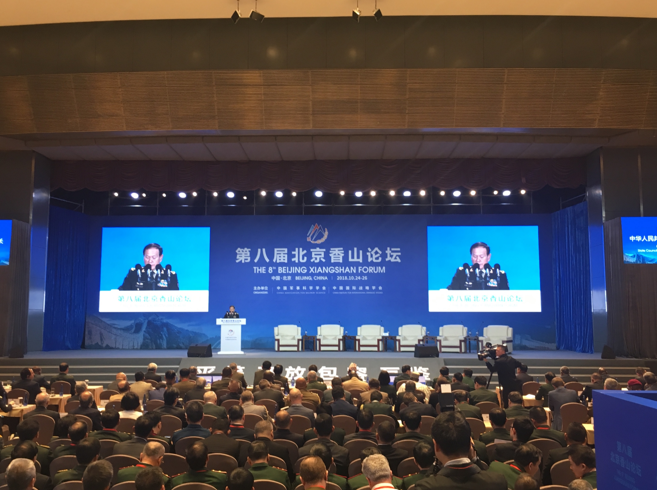 The 8th Beijing Xiangshan Forum, being held on Oct. 24-26 at the Beijing International Convention Center, has brought together over 500 delegates from more than 70 countries and international organizations to consider greater security cooperation. At the opening ceremony, held on Oct. 25, General Wei Fenghe, state councilor and minister of national defense of China, read a letter of congratulation from Chinese President Xi Jinping during his opening speech on building a new type of security partnership. The theme of this year's forum is "Building a New Type of Security Partnership of Equality, Mutual Trust and Win-Win Cooperation," with topics for four plenary sessions including "New Ideas for, and New Approaches to, International Security Governance," "Terrorism Threats and Countermeasures," "Reality and Vision of Maritime Security Cooperation" and "Challenges and Cooperation in regard to U.N. Peacekeeping." Li Zhanshu, chairman of the National People's Congress Standing Committee and a member of the Standing Committee of the Political Bureau of the Communist Party of China Central Committee, attended the welcome dinner on Oct. 24 and delivered a speech. In his speech, Li spoke highly of the achievements and changes China had made over the 40 years of the country's reform and opening-up, saying the road of the country's reform and opening-up has been the "path of win-win cooperation between China and the rest of the world." He said that with an aim to build consensus and expand cooperation, the Beijing Xiangshan Forum has developed into a high-level security and defense forum in the Asia-Pacific region with significant international influence. A seminar on young Chinese and foreign military officers was also held on Oct. 24, inviting delegates from China, the U.S., India and other countries to share their opinions on regional security and new ideas for international security governance. "We hope this seminar could offer an opportunity for young military officers and academics to discuss international and regional security issues from a younger generation perspective, in a bid to strengthen the exchanges and friendship as well as to shed light on the future security partnership," said Zhao Xiaozhuo, director of Beijing Xiangshan Forum Secretariat and a researcher from the Chinese Academy of Military Science. This year's forum sees increased participation from developing countries in Asia, Africa and the South Pacific region, as well as new events including the seminar for young academics and military officers. China is hoping the event will help all parties to further strengthen strategic dialogue and communication, accumulate consensus, deepen practical cooperation, jointly address global security challenges and maintain peace and stability, according to Colonel Wu Qian, the spokesman of the Ministry of National Defense. Inaugurated in 2006, the forum has been held once every two years from 2006 to 2014. China has invited more foreign defense officials and scholars since 2015, upgrading it to an annual meeting. This year, the Xiangshan forum became the "Beijing Xiangshan Forum."